One word to describe this polish, BOLD. I fell in love with this when I saw it on Nory over at Fierce Makeup & Nails and I had to have it! I think the pictures are very close to accurate, which is extremely rare for neons :-P. Formula was amazing, this is 2 coats and top coat, no white underwear required for this little baby! Hope you all have a gret week. Also, Nory is hosting Blogger Love Week which features a few bloggers and some fun facts about us, stop by and check it out over at Fierce Makeup & Nails! It looks real gorgeous and bold! I need to get one for myself, seriously! You should its really awesome! IT GORGEOUS!!!! I absolutely love it! Mmm, not for me, that's for sure. I'm not that bold. I don't have any yellows and only one orange. LOL yeah it is really out there, you can't be missed with this polish on. I remember I would never do colors like this before,I used to do a lot of pinks & reds and thats as far as I would go. I think now I have no limits LOL. Loving this yellow, I haven't many yellows but this is a nice shade. This looks so great on you!!! Perfect summer polish! Beautiful color, perfect for summer. I love it! 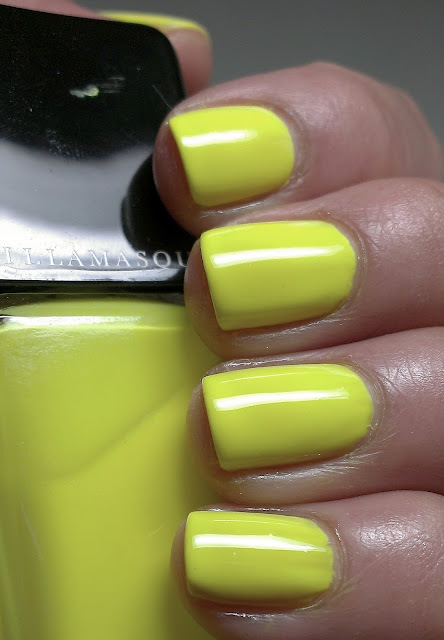 I really love the bright, highlighter-ish neons that are out this summer! This one is just so stunningly gorgeous!! that's a funny and pretty polish!! I love that you don't have to use a white base for it!! and your pictures are gorgeous, as always! Bold is right, love it! Damn girl your last few weeks of posts have been hot!! Everyone has been gorgeous!!! Im loving it! This is a gorgeous yellow and it looks gorgeous on you! Ungghhh! This is so gorgeous! Beautiful! I remember when Nory showed me this...so cool! Dude this is like a hilighter on your nails! I love it! Did you redo your blog design again? It's fab!